Rack Electric is happy to offer their generator installation services to homeowner associations across South Florida. Homeowners associations (or HOAs) are the predominant property management service found in South Florida, with over 3,000 HOAs existing across Palm Beach, Broward, and Miami-Dade counties. In fact, there are over 200,000 homes in Southwest Florida managed by HOAs alone. HOAs were designed to collectively manage entire neighborhoods and provide them with a range of amenities at a fraction of the cost. South Florida homeowners associations are constantly growing and looking for ways to improve. If you’re a South Florida HOA looking to provide for your homeowners, then consider our standby generator installation services. Every year, South Florida faces the impending dangers of hurricane season. These powerful storms are known for their devastating effects such as flooding and even the destruction of homes. Most storms during hurricane season have winds powerful enough to decimate trees and powerlines alike. Large tree trunks blocking the road makes it impossible for cars to drive through, trapping people in their homes completely. Downed power lines can leave homes completely in the dark for hours, days, or even weeks. Without the necessary power, your homeowners are left to sit in darkness until help eventually comes. You want the best for everyone involved, which is the very reason you’re a member of a South Florida HOA. To ensure that everyone stays secure and comfortable during even the worst of storms, consider having Rack Electric install standby backup generators in everyone’s home. 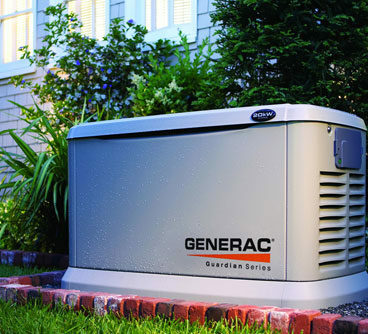 These standby generators are designed to provide your homeowners with immediate power as soon as the original utility power goes out. Our generators can last up to 3,000 hours of constant and continued power to each home, powering each and every appliance/device. With Rack Electric, you guarantee the safety and security of your residents. As the best HOA generator installers in South Florida, we guarantee your satisfaction. While we don’t offer the lowest prices on our generator installation services, we ensure that the job will be done the right way the first time. Other companies may offer their service at a large discount, but they perform lackluster jobs. You’ll most likely have to call them over and over again to repair your standby generators. The last thing you want is to invest in your homeowners and let them down when they need their generator the most. Get the job done right the first time, and you’ll never have to worry about it ever again. HOAs were designed to look out for their homeowners and provide them with the best amenities. This year, give them the gift of power with Rack Electric. Our generator installation teams will handle the process of procuring the proper permits, as well as installing each and every generator while being as minimally invasive as possible. Our electrician teams will make sure to leave your neighborhood exactly how it was when they first arrived. 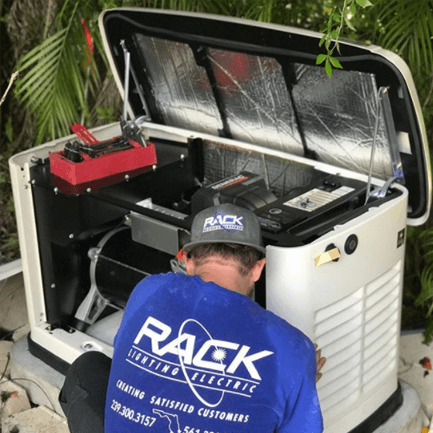 If interested in Rack Electric’s HOA generator installation services, call us today at (561) 391-3550 or visit our contact page and a representative will get back to you as soon as they can!